Apparently there is some discrepancy in the record for the games played in 1936, where it would seem that it should be Crimson Won in La Ceiba, and Tela Won (which means Arsenal Lost) in Tela. Nevertheless, it is noteworthy that after the long break from 1939 to 1947, no doubt due to the World War II, Belize football once again established its high ranking by defeating the Victoria club of La Ceiba, Honduras. There would still need to be some investigation to determine the level that these clubs held in regard to their national league. It would naturally be expected that these were the top ranked teams in the Honduran or Guatemalan leagues that the Belize champion teams were going up against. Not mentioned in that chronicle of international visits, is an encounter between All Star and the Honduras champion, which would have been sometime around 1945-47 when All Star was leading the local league. According to C.B. Hyde, the team that made the trip was not the full All Star team, but had a few players from other teams. Nevertheless, he explains that it was not a game they were proud of, as, despite demonstrating their ability to compete, it was a terrible learning experience for All Star. What happened to All Star, was that they outplayed their opponents in the first half with their passing game, which was always geared towards moving the ball upfield into an attack, not satisfied without an attempted strike at goal. All Star led 1-nil at the half. But their opponents, according to C.B., had devised a masterful plan for the great All Star. Their opponents defended the whole of the first half, laying back and conserving their energy. In those days there were no changes allowed, so the eleven that started the game was the eleven that had to finish. Even when they gained possession, the Hondurans would carry the ball only up to a certain point, then start passing the ball around, allowing the All Star players to tire themselves out trying to re-gain possession. In the second half, the All Star players were “knocked out”, and the Honduran champions thus proceeded to unleash their attack, loading 7 unanswered goals onto the proud All Star team for their greatest loss margin, 7-1. It was the most devastating defeat that the All Star team would ever experience, but it was definitely a learning experience for a team that prided itself on applying the best technique to “the beautiful game”. Over the years, Amandala has covered a lot of the Dunlop saga, and we won’t recount the whole story here. But a couple notes not previously covered are worthwhile to complete the picture of the times that produced a team still remembered in reverential tones. 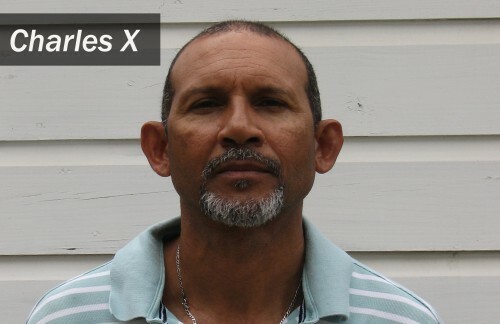 Winty J (Vincent Johnson), who grew up with the Mugger as his idol, has said that “Bobby Moore” brought Louis Antonio “the Mugger” Garbutt from Honduras at the age of 5, which suggests that Moore was either a stepfather or guardian of the young Antonio. Moore was said to be many things, including a gambler, and a shifty one at that. And he must have had some influence on the young Louis Garbutt developing a vision of his life dedicated to sports as his way forward. Cricket was a “gentleman’s game,” and we have heard no mention of the Mugger ever making a serious effort at playing cricket. But he was a big star in basketball (Willy Wiley Cobras and Dunlop) and football (Dunlop and Independence). Gilbert “Pine” Hernandez, captain of Dunlop, said that when, following their championship season, manager Bobby Moore took the Dunlop team on a trip up into Mexico, he strongly suspected, from the bits of conversation he picked up, and the body language he observed as Moore negotiated with his Mexican counterpart around a table in a restaurant, while team members were eating, that Moore was looking to “sell” the players to the Mexicans. At the time, there was no professional league in Belize, but the Mexicans knew talent when they saw it, and Bobby Moore was not one to pass up an opportunity to make a deal. There is still a whole lot to learn about that trip and the subsequent disintegration of one of the great teams Belize had produced. Hopefully, Pine can sit us down one of these days and tell the whole story as he saw it. What is certain, Dunlop was a bright flash on the scene, daring youngsters (undefeated junior champions) shaking up the adult football world by holding the reigning senior champions Diamond-A to consecutive draws; and then proceeding the very next season to prevail as Belize City champions. That was in 1958-59. 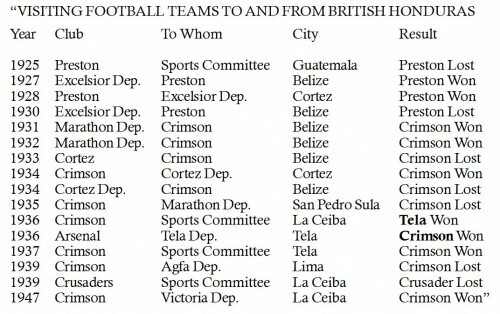 One noteworthy point of interest here is that, in the earlier mentioned list of “All Belize” football players in the 1962 Souvenir Programme, there are a number of players named as coming from the Dunlop team (“J. Young,” “A. Williams,” “R. Barrow,” “G. Dunn,” “L. Garbutt,” “N. Robinson,” and “W. Labriel”), which would imply they were playing on Dunlop at that time; while three other players listed as BEC members were former stars on Dunlop (“G. Hernandez,” “G. Ellis” and “E. Wilson”). This would seem to suggest that, were it not for the defection of Pine, Chico and Reds, Dunlop might have indeed become a dynasty. The complete names and familiar nicknames for some of those listed above, as we recall, would be: John Young, Anselm “Drake” Williams, Randolph “Tiempo” Barrow, Gilly Dunn, Louis “the Mugger” Garbutt, Nelson “the Roo” Robinson, Wellington Labriel, Gilbert “Pine” Hernandez, Gilbert “Chico” Ellis and Ernest “Reds” Wilson.